For a recent trip to the Sacramento area, I booked a three-night stay at the Marriott Rancho Cordova. While it is a pleasant property with attentive personnel, there are some things to note before choosing this particular hotel. When we arrived, a large conference was in full swing. The driveway, where one can often park to check in, was full and the parking lot was equally crowded, meaning a longer trek with luggage in tow than should have been the case. Upon entering, the lobby was full of sign-in tables and vendors, and was crowded by conference attendees, making the arrival experience much more frenetic and less gracious than it otherwise might have been. It also meant a longer wait to check in, as front desk staff were occupied assisting conference attendees in addition to those of us who were just arriving. On the wall beside the front desk, I noticed the plaques that declared this hotel a AAA Four-Diamond property. More on that later. When my turn came, check-in was smooth, and I headed for my 7th floor room. On the way to my room, I spoke to one housekeeper about getting bathrobes sent to the room. She recommended that I call housekeeping, which I did. After a bit of unpacking and freshening up, I left the room and exchanged pleasantries with a second housekeeper. To my surprise, the offending fast-food trash was still in the elevator lobby despite two housekeepers working the floor. Definitely not consistent with the hotel’s Four-Diamond rating. Guest rooms are very nice and our King guest room was considerably more spacious than many in which we’ve stayed. The living area was more than 16 feet by 13 feet, leaving plenty of room to move about and enjoy the separate chair and ottoman, work at the desk, watch TV, etc. The room also had a small fridge, generous closet space with iron and board tucked away, and plenty of outlets to charge our traveling electronics. The bathroom was also generous and offered with high-end amenities, a hair dryer and combination tub and shower. The hotel also has a business center, pool and fitness center, Internet access ($4.95 per day, waived for Marriott Rewards members) and free parking. There is one restaurant, Formaggio, and a Starbucks coffee shop on site. Service was generally very good. Employees greeted guests as they passed in the hall or common areas, and were gracious when answering the phone or dealing with people in person. Overall, however, the property fell short of its professed Four-Diamond rating. According to AAA’s published standards for its Diamond ratings, rooms in a Four-Diamond hotel should have seating for three guests; the seating in our room would not accommodate three unless one sat on the bed or the ottoman of the easy chair. This Marriott does not provide in-room safes, meaning that guests do not have the option of leaving their electronics and other valuables in a secure location. Bathrooms in Four-Diamond properties should have towels that are plush to touch; ours were thin and scratchy. Showers should include a custom water feature: either body jets, a hand-held sprayer, multiple shower heads, or something similar. Ours had one large shower head, which was fine, but by itself did not meet Four-Diamond criteria. Tubs should also have a custom feature; ours did not. 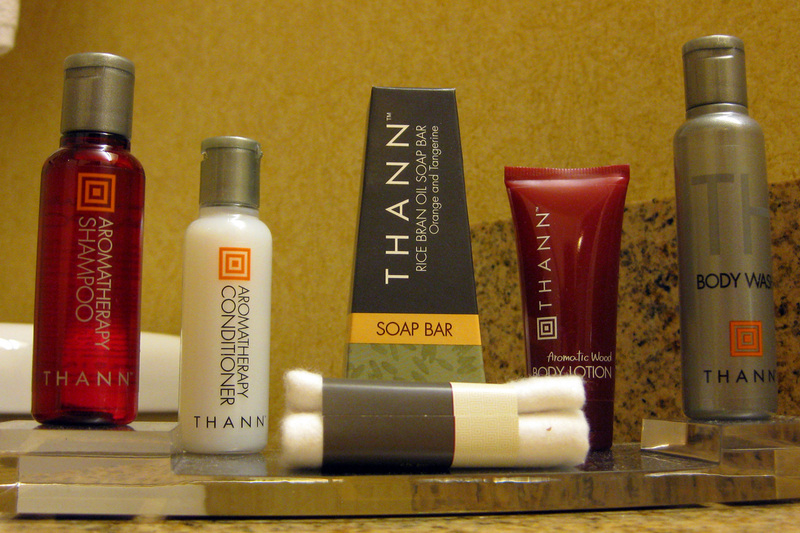 Bath amenities should include two large-size bars of soap in addition to other items. Ours had only one bar of soap, and neither it nor the other amenities were ever replaced during our three-night stay. Housekeeping seemed a bit off its game, as they left used wine glasses in the room rather than removing them, two days in a row. My intent here is not to be overly picky; the property was nice enough and I would stay there again if I could confirm there were no conferences scheduled during the time of my visit. Nonetheless, a property has to meet an extensive list of subjective standards to earn four diamonds. In my estimation, this property is a solid Three-Diamond hotel, but falls short of its Four-Diamond rating.